Have vocabulary fun with this bell-ringer reource combining idioms and context clues. 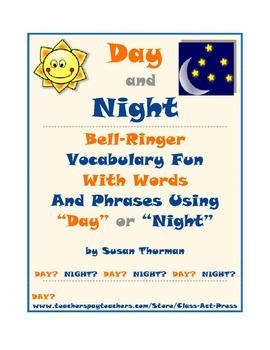 Many idioms and other expressions contain the word day or night, and each of the 22 answers in this printable 3-page activity uses one of these words. Students read fill-in-the blank sentences and then use context clues to determine what word or phrase is appropriate. Also included in the activity is a separate answer key. This classroom-tested activity has been used successfully in middle school, high school, and college classes. Created by Susan Thurman. To learn about new Class Act products, discounts, and freebies, just follow me. Find my picture at the top right of any page in my store. To the right of the picture is a star with “Follow Me” beside it. Click on the star, and I’ll send you customized updates about this store. You receive 1 TPT credit for each dollar you spend, and you can spend it just like cash on future Teachers Pay Teachers purchases. •	On Second Thought: Looking at Phrases That Use "Second"